That arrow is sort of like the St. Louis Arch. While we can't promise that a St. Louis Arch will appear over your St. Louis ribs, we can promise that Niman Ranch St. Louis ribs are the best ones you'll ever have. Do you ever get the feeling that you're being followed by a rack of St. Louis ribs? We've all been there: You're just walking along when you hear those barbecue sauce footsteps; you feel that porky presence that is at once more meaty and more flavorful than the baby back rib presence you experienced last week; you sensate your fingers and face becoming sauce-covered; you turn around only to find there are no St. Louis ribs following you. This is when you turn the table on those badgering St. Louis ribs and pursue them. St. Louis-cut ribs are so meaty and flavorful that, after you eat the batch you'll be getting for this weekend, you'll prefer getting followed by St. Louis ribs. 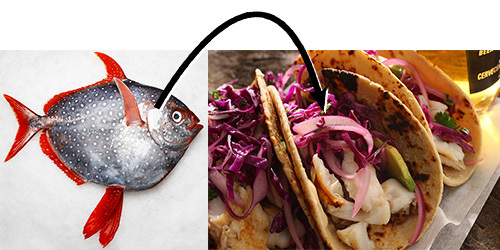 That very opah (or the filet you'll get from our seafood case) can be turned into those fish tacos. It's a progression that occurs every day in nature. Do you ever get the feeling that you're being followed by an opah? Probably not. That never happens. Opah can't walk around as easily as St. Louis ribs. A nice compromise between swordfish and tuna, opah has a rich, creamy texture and a firm, fatty flavor. Use it in the fish tacos you'll be making this weekend. A wrinkled-rind cheese walks into a bar. The barkeep says, "Hey, you appear to be somewhere between a vegetable-ashed Loire Valley bloomy rind and a Piedmontese Robiola." The cheese says, "That's quite observant. And I'm straight outta North Carolina." The barkeep says, "Were you dusted in vegetable ash before you developed that doughy, wrinkled rind?" The cheese says, "Of course." The barkeep says, "And I bet you begin tangy, bright and chalky, but then break down from week to week into a slow, oozing paste with obvious notes of butter-roasted mushroom and toasted almond." The cheese says, "Yep." The barkeep says, "I don't really see a joke here." The cheese says, "I don't either," and walks out. Anyway, this is such a good cheese and we have it with a Friends & Family discount.